Smaller bottles - no need to open a whole standard size bottle! Green glass used traditionally for red wines. Perfect for gift bottles around the holidays! Clear glass used traditionally for white wines and fruit wines. Vacuum powered wine filler, that can fill up to 600 bottles/hour! 4 Stainless Steel Filling Nozzles provide stability and will last you for years to come. Wine tank can be up to 12 feet below the Enolmaster. Also fills magnum size bottles. Vacuum powered filling allows for no contact between wine and pump or mechanical components. This item ships via freight truck! Please note this item is not currently in stock, but is available for Pre-Order. Product should be available around mid to late May. We do require payment in full in order to reserve stock. 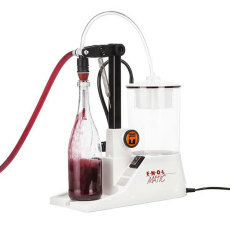 An adjustable, vacuum-pump driven wine bottle filler that fills bottles automatically! Evacuates most oxygen during filling and can fill bottles of almost any size! No need to lug heavy carboys around, the vacuum pump pulls wine from the carboy and into the bottle! Can bottle up to 200 bottles of wine per hour! 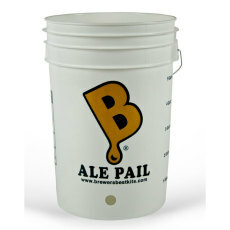 A 6.5 gallon bottling bucket used to bottle beer or wine. These standard Bordeaux bottles are made from red colored glass and would be perfect for Holiday wine bottling. Actual shipping rates apply to all cases of bottles. This product does not qualify for Flat Rate Shipping. This is the Renana Altus bottle. It is extra tall for a 375 ml bottle, and has a clear (or "flint") color. It is wonderful for ice wines, late harvest wines, or vinegars, and can be used for liqueurs. It makes a very nice gift presentation bottle also. It is designed for a cork finish, using the #8 cork, although with a very good corker you may be able to use a #9 cork. It comes packaged 24 to the case, and is only sold by the case. Actual shipping rates apply to all cases of bottles. This is a clear, small champagne bottle that has a variety of uses, allowing for the fact that it can be capped or corked. It may be corked with a #7 cork, or capped using standard beer caps. 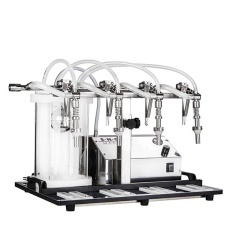 It is ideal for small samples of wine, for ice wines, or for barley wine. It's size is 187 ml, or basically 6.3 oz. The bottle is approximately 7.5 inches tall, and is packed 24 to the case. They are only sold by the case. Actual shipping rates apply to all cases of bottles. These Burgundy bottles are smooth shouldered with a slightly sloping neck. They are green in color, and classically these bottles were used to bottle wines from the Burgundy region, but of course, you may use them as you see fit! They are great for Chardonnay, Petite Sirah, Pinot Blanc, Pinot Noir and Syrah. They are designed for a cork finish, so use a #9 straight cork. They come 12 to a case and are sold by the case. Actual shipping rates apply to all cases of bottles. Bordeaux bottles (also less commonly called Claret bottles) contract sharply at the neck. This configuration makes them stay in a slanted wine rack a little better. Traditionally people use the green bottles for red wines and the clear (or "flint") bottles for white wines. This style of bottle is used for many commercial wines in France and elsewhere around the world. While tradition is a strong motivator, you may certainly use this bottle for any type of wine, at your pleasure. These bottles are 750 ml, or about 4/5 of a quart. They are cork finished, which simply means that they must be closed using a cork. They come 12 bottles to the case. Actual shipping rates apply to all cases of bottles. Bordeaux bottles (also less commonly called Claret bottles) contract sharply at the neck. This configuration makes them stay in a slanted wine rack a little better. 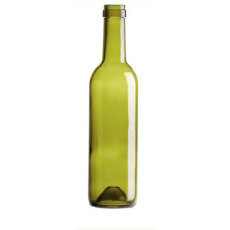 Traditionally people use the green bottles for red wines and the clear (or "flint") bottles for white wines, although you may use them as you see fit!. This style of bottle is used for many commercial wines in France and elsewhere around the world. While tradition is a strong motivator, you may certainly use this bottle for any type of wine, at your pleasure. These bottles are 1.5 liters, or about a gallon and a half. They are cork finished, which simply means that they must be closed using a cork. They come 6 bottles to the case. Actual shipping rates apply to all cases of bottles. A unique blue glass bottle for your wines and meads!